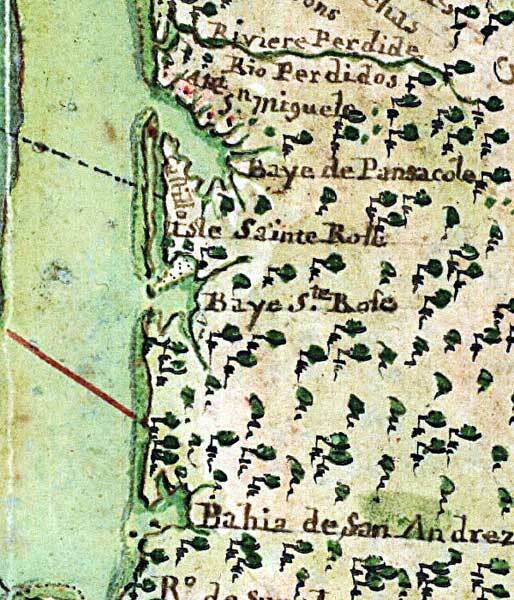 Description: Detail from the 1747 map "Carte general de toute la cote de la Louisianne jusqu'a la Baye St. Bernard, coste de la Floride, Baye de la Mobille, Be. de Pansacole, Baye de St. Ioseph, St. Marc des Apalaches. dans l'Amerique septentle., 1747 / A. Debatz, fecit." showing the Gulf Coast west of Apalachee Bay near Pensacola Bay, Santa Rosa Island, and St. Andrew Bay. The map includes coastline, coastal features, numerous interior streams, pictorial representation of vegetation, European and Native American settlements, and Native American nations. North is orientated to the right in this detail.